The recent revelation that the head honcho of Hyflux (together with other top executives) continued to make millions while the troubled water treatment firm was drowning in debt sent shock waves of disbelief across Singapore even as investors brace for the fall-out. With anger mounting as shareholders grapple with the fact that their investments - for some, their retirement savings - in the beleaguered water treatment firm have evaporated, the issue of CEO compensation is dragged once again into the spotlight. While it seems that top dogs are fattening themselves at the expense of shareholders and staff, others argue that many other factors weigh on CEO compensation. In addition, pay disclosures can be misleading as CEOs' take-home pay is often significantly lower in reality, they add. According to a Korn Ferry Hay Group study in 2017, the median total pay for CEOs at Singapore-listed companies was constant at S$625,000 per annum in financial year 2016. While CEOs of large companies had a median remuneration of S$3.41 million in 2016, medium-sized company CEOs were paid S$1.25 million. 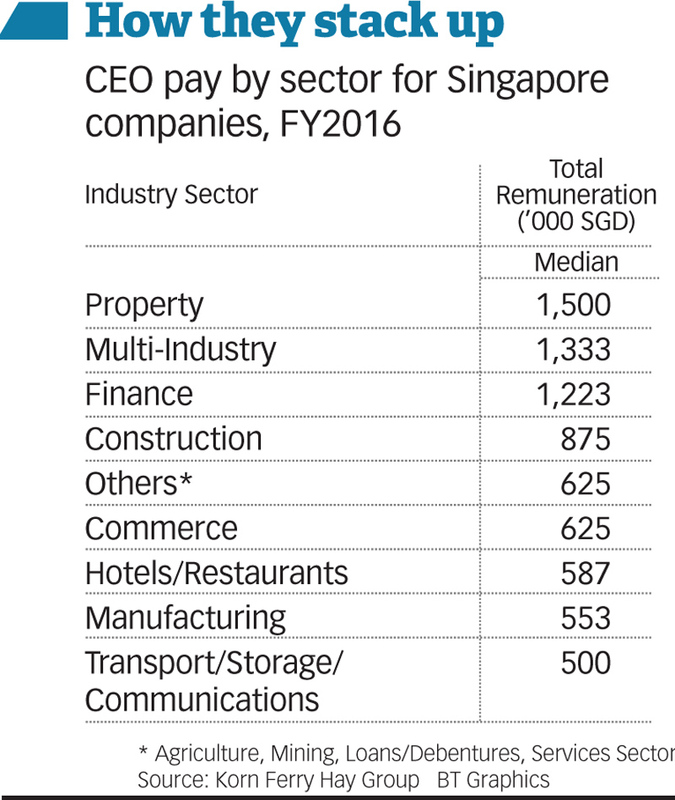 The median total pay for small company CEOs was S$599,640, and for Catalist company CEOs, S$375,000. For a start, the compensation package of a CEO is very different from a typical employee on various counts - and not just the amount. As Doug Friske, managing director at Willis Towers Watson, puts it: "The whole decision making process is different." For most employees in an organisation, it's usually their managers and HR that decide on their pay packages. But for CEOs on listed companies, it's the remuneration committee from the board of directors that decides on their compensation, he explains. According to Christine Koh, senior client partner, advisory at Korn Ferry Singapore, the remuneration committee is in charge of establishing a governance foundation for compensation to ensure that it is "fair and equitable". Key considerations include the overall organisation's direction, its expected results and affordability, she adds. The typical CEO compensation structure in most Singapore companies is likened to a three-legged stool, consisting of fixed pay, short-term incentives, and long-term incentives, says Shai Ganu, managing director, talents & rewards, South Asia, at Willis Towers Watson. Short-term incentives, or the annual bonus, is typically linked to one year's performance and paid within the first quarter of the subsequent year, he says. Long-term incentives (LTIs), on the other hand, take into account a performance period of three to four years, where companies make contingent grants subject to achievement of performance conditions after the fixed time frame. Within the top 150 companies listed on the Singapore Exchange, about half of them have at least one LTI plan, with LTIs typically making up 30-35 per cent of total compensation for CEOs, according to findings from Willis Towers Watson. But not all Singapore companies reward their CEOs in a similar fashion. Mak Yuen Teen, associate professor of accounting in NUS Business School, says that CEO remuneration in professionally managed companies is generally determined by benchmarking to peer companies - usually of similar industry and size. But for family-managed firms, family shareholders generally have a lot of influence over remuneration, notes Prof Mak. "Even if they appoint an external remuneration consultant, I haven't seen these consultants having much impact," he says. Often, their remuneration is much more than what a CEO of a professionally-managed company will get. "It is not right but that's the way it is because CEO and executive remuneration do not require the approval of minority shareholders, and the majority shareholder chooses the independent directors who set the pay of the CEO," he explains. Prof Mak points out a trend where the bigger the company gets, the fixed salary component tends to fall as a percentage of the total remuneration, and the bonus and share incentive components increase. Family firms - which tend to be smaller - usually have a higher annual salary component as a percentage of total remuneration, and less in terms of cash bonuses and share incentives. Just a few years ago, the compensation model was a lot simpler with just a fixed pay component and a bonus, says Mr Ganu. But now, most companies have moved to the three-legged stool model with the added LTI component so that CEOs will think longer-term. The instruments used to reward CEOs are also different. Stock options used to be popular up to five years ago, which worked well when share prices kept going up, he says. "But in an environment of declining productivity and market uncertainty, there are quite a few cases in Singapore where operating performance has gone up but share price has gone down, which has nothing to do with management's actions." As a result, companies have moved away from this. The most significant change has to do with corporate governance. The role of the remuneration committee started becoming more important in the last five years, says Mr Ganu. "Five years ago, if you look at board committee fees, the highest paid was audit, and then the rest at the same level," he explains. "Now, the highest paid is still audit, but the second highest is the remuneration committee, followed by the rest." There is a premium for directors sitting on remuneration committees because of the expertise needed and the reputation risk involved. "No one wants to be on the front page for rewarding the CEO several million dollars when the share price drops," he says wryly. Singapore's CEO compensation model also differs slightly from other developed countries. Kumar Subramanian, partner, South-east Asia, talent, rewards & performance, Aon, says that the LTI component here is "quite modest" compared to countries such as the US, UK and Australia. "The typical CEO of a large-cap Singapore company would receive about one-third of his or her total compensation in long-term incentives," he says. "While in other developed markets, it would be in the range of 40 to 50 per cent, and in a number of cases, even above 50 per cent." For all the changes over the years to executive remuneration, a key focus has been to strengthen the link between pay and performance in Singapore. But according to Chen Guoli, associate professor of strategy at Insead, this is much easier said than done. "The major flaw in the current compensation design is whether the CEO pay is tied to performance," he says. There are many complicated issues behind this: "For instance, how we can measure firm performance, what are the performance indicators, to what extent can we actually measure their direct effects on firm performance, and how to ensure CEOs are not misguided to destroy the firm's long-term value." Singapore's scorecard on this front, however, seems to be fairly positive despite mixed signals. In a report by Willis Towers Watson in December 2018, it was found that the total value of rewards awarded to CEOs has increased by 20 per cent over the past five years on a nominal basis. However, the value of the base salary and take-home total compensation has actually stayed flat, if not lower, says Mr Ganu. In essence, what this means is that not all CEOs managed to unlock the potential gains from the LTIs. In the Willis Towers Watson study, only 48 per cent of the performance share plans granted three years ago actually met threshold performance conditions - in other words, more than half of awards expired worthless. Overall, for every S$100 worth of reported LTI granted in Singapore over the past five years under performance share plans, executives took home only approximately S$25. Thus, while annual report disclosures suggest that CEO pay levels are going up and may seem misaligned with company performance, this is actually misleading, continues Mr Ganu. "The link between pay and performance is reasonably strong - particularly when you consider take-home pay, or realised pay," he says. But according to a separate 2017 study by Korn Ferry, one in five (21 per cent) Singapore-listed firms in FY2016 paid bonuses to their CEO despite incurring a loss. Some 32 per cent paid higher bonuses to their CEOs, despite lower profitability. The report came from data of CEOs from 541 listed companies on the Singapore Exchange that filed their annual reports between May 1, 2016 and April 30, 2017. Commenting on the discrepancy, Mr Ganu notes that in FY2016, companies might have experienced the impact from the slump in oil prices which had muted company performance - a factor which management may not necessarily have control of. He also points out that by design, executives should not get "disproportionately high or low rewards" due to extraneous factors. "So in good years, companies do not end up paying very high bonuses for the overall water-level rising, and in bad years, companies don't pay zero bonuses for low tides." Mr Ganu says that this lower volatility is a unique and important aspect of executive compensation in Singapore, which prevents "feast or famine outcomes". He adds that it is also important to understand the starting point for assessing performance, especially for year-on-year growth. "Imagine being a shareholder of a $100 million loss-making business: if through the efforts of management, they were able to improve the position in one year to only a $10 million loss - then in that context, it might make sense to pay management bonuses, but not full amounts, for helping turn the business around, and stemming some of the historic losses," he says. Korn Ferry's Ms Koh concurs that with transparency becoming a top priority for businesses and shareholders, the relationship between performance and pay has strengthened in the last few years. She notes that more companies have stepped up in this aspect as executive remuneration has remained slow, with more emphasising variable compensation to determine pay levels. While there is a reasonable case to show that Singapore companies practise pay-for-performance alignment, industry watchers point out that there are some common flaws seen in CEO remuneration here. The first is the emphasis on short-term incentives. Ms Koh observes: "Many companies tend to focus more on short-term incentives as they may not have a strong pay-for-performance structure in place and tend to provide instant gratification to results achieved." To overcome short-sightedness, Prof Mak suggests that instead of having a large annual cash bonus component linked to a single-year financial measure such as profit, companies should use a small portfolio of measures, including qualitative measures such as people development or customer satisfaction, to determine performance. Aon's Mr Subramanian goes one step further by proposing that long-term incentives should be stretched longer, and ideally performance periods need to be five years and upwards, compared to the current practice of 3-4 years. He also highlights the need to refine existing "claw back" policies to ensure that the board can recover historically paid compensation, in the event of adverse outcomes such as fraud and misstatement of financials. The remuneration committees in Singapore also need to invest more time in compensation disclosure to justify pay for performance, he points out. He says: "In comparison with global peers, disclosure practices in Singapore companies are quite basic and it's difficult for shareholders to draw meaningful conclusions with regard to the alignment of pay with performance." Mr Ganu concurs that remuneration committees fall short by providing "boilerplate explanations" to account for their decisions instead of providing any real answers. Another observation he makes is that boards in Singapore tend to follow market practice when it comes to CEO pay. "But this is not the same as best practice," Mr Ganu notes. "And what's even more important is best fit, rather than best practice. One of the discussions that needs to happen is the courage to try innovative compensation structures because it's the right thing for your business." Insead's Prof Chen says that from an economics perspective, there is "nothing wrong" for a CEO to get high pay, as long as it reflects their talents, efforts and impact on the firm's performance. "This is how we motivate people - (creating) a pay-for-performance system to encourage people to work hard to deliver," he says. But Ms Koh disagrees that CEOs need high pay as a motivator for exceptional performance. "Rewards should fit the context," she says. "External comparisons are helpful, but they shouldn't dictate how much to pay a CEO." Even as the remuneration committee technically holds the reins when it comes to CEO compensation, politics sometimes inevitably comes into the picture. Prof Chen notes: "If CEOs stay in the firm for a long time consolidating their power and becoming more and more entrenched, their pay may just be a reflection of their power rather than their contribution to the firm's performance." He adds that it is the key reason why firms need a good corporate governance system to reduce the likelihood of managerial issues, or what is known as an "agency problem". While many boards still look at financial indicators as the sole means to determine compensation, this is fast changing with the times. Prof Mak explains: "Today, there is an increasing emphasis on sustainability, environmental and social performance of companies. At the moment, this is still more lip service for many companies here, but institutional investors and regulators are pushing companies in this direction." Therefore, he expects that for professionally-managed large companies, there will be more pressure for CEOs to be evaluated and rewarded based on the above factors. Looking ahead, Ms Koh projects that the remuneration levels for CEOs and top executives will likely remain flat or increase moderately in tandem with the financial performance of the company, in light of the current economic climate. Now more than ever, there is a need for firms to put in place a robust, transparent, and easy-to-communicate compensation framework to determine CEO pay so as to manage the expectations of everyone involved, she says. "This would certainly be helpful as boards and remuneration committees face increasing scrutiny over their performance and are held accountable for their decisions," she says.